1Department of Medicinal Chemistry, Theodor Bilharz Research Institute, Kornish El-Nile Street, Warrak El-Hadar, Imbaba, Giza, EGYPT. 2ClinicalChemistry Department, Theodor Bilharz Research Institute, Kornish El-Nile Street, Warrak El-Hadar, Imbaba, Giza, EGYPT. 3Department of Chemistry, Faculty of Science, Ain Shams University, , Kornish El-Nile Street, Warrak El-Hadar, Imbaba, Giza, EGYPT. 4Pathology Department, Theodor Bilharz Research Institute, , Kornish El-Nile Street, Warrak El-Hadar, Imbaba, Giza, EGYPT. Introduction: Cisplatin is a highly effective chemotherapeutic agent; its clinical use is severely limited by serious side effects as nephrotoxicity. 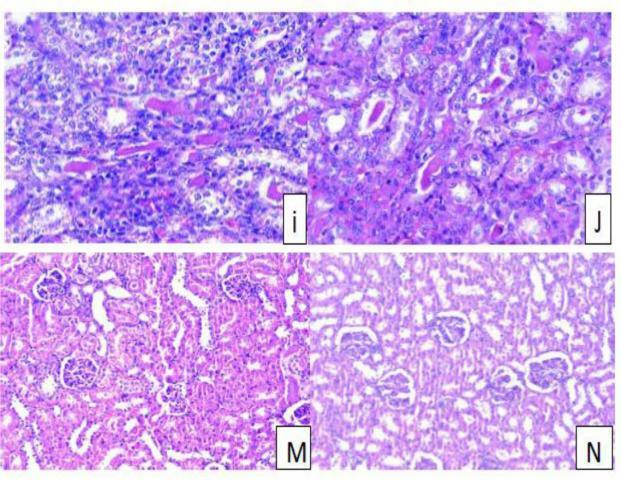 The aim of this study is to evaluate the nephroprotective activity of defatted methanolic extract of two Egyptian plants: Lantana camara and Cucurbita pepo and certain fractions derived from the defatted methanolic extract of L. camara on cisplatin-induced nephrotoxicity in rats. Also, identification of certain chemical constituents of L. camara by HPLC-ESI- MS. Methods: Nephrotoxicity was induced in rats by single dose of cisplatin. The effect of plants extract at doses 100-400 mg/kg.b.wt comparing with standard; ascorbic acid; was determined using serum urea, creatinine and some ions. Furthermore, the effect of these extracts on some renal antioxidant enzymes and histopathological examination of kidneys were examined. Results: The defatted methanolic extract and ethyl acetate fraction of L. camara showed the highest improvement of renal parameters. Also, HPLC-ESI-MS analysis of L. camara extracts exhibited bioactive phenolic compounds including phenyl ethanoid, flavonoids and phenolic acids. Conclusion: The phytochemical constituents of L. camara are responsible for their nephroprotective activity. Keywords:Antioxidant enzymes, Ascorbic acid, Creatinine, Flavonoids, Histological studies, Phenyl etanoid. Abdel-Hady H, El-Sayed MM, Abdel-Hady AA, Hashash MM, Abdel-Hady AM, Aboushousha T, et al. Nephroprotective Activity of Methanolic Extract of Lantana camara and Squash (Cucurbita pepo) on Cisplatin-Induced Nephrotoxicity in Rats and Identification of Certain Chemical Constituents of Lantana camara by HPLC-ESI- MS. Pharmacognosy Journal. 2018;10(1):136-147.